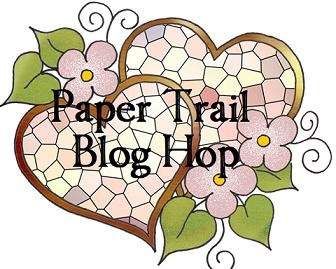 I loved the the Sarita paper pack when this catalog first came out and have waited patiently (eh, maybe not so patiently) for it to be the feature on the Paper Trial blog hop. If you came from Linda's blog, you already know why I'm so excited! The rich colors and trendy/retro designs are to die for! I made two birthday cards this week with the paper for a friend and my mom. After getting inspired from these cards, hop along the trail to Karen's blog! Pretty cards. I like the way you featured the pink! I like the accessories that you chose for the cards...I love your cards and am always surprised when I see them instead of scrapbook pages! Thanks for inviting me to the Paper Trail, I've enjoyed my stay! great cards! I love the use of the embellishments!!! looks like Spring! The card on the left would be perfect for Easter with an egg on it! Nice!